I trusted my land, what I put into it, it gave back to me; for some years now it has become unreliable; now my coffee field is sick. It was sad to cut down the plants, now I am sad. Different voices in the country are expressing their demands and proposals about the coffee rust problem. The principal demand is that the dimension of the damage be quantified, that inputs be provided, that the small-scale producers affected be compensated and be supported in the renovation of their coffee. The government has responded saying that even though they have not declared a state of emergency, they “are already working on the emergency.” (A. Bucardo, La Prensa, 2-3-13), and that “officials from various ministries are working on a national strategy to fight the coffee rust, so that in the coming weeks we will be obtaining solutions to this terrible plague that has affected the coffee fields.” (R. Murillo, La Prensa, 2-2-13). In other words, subsidies in chemical inputs to fight the rust are not coming, nor is the restructuring of bank debts nor subsidized financing for the renovation of coffee fields. This situation leads to the solutions being achieved in a rather shared form among the government, the cooperatives, the associations, the companies and the producer families, a consensus that could also be supported by international organizations as well, like the IADB, FAO, the European Union and organziations that work with coffee, like international fair trade and organic coffee certifiers. This article seeks to provide support for this scenario in a concrete way by discerning the dimension of the problem, explaining the very reductionist dominant vision, and providing clues for a vision that might respond to the majority of the producer families. The coffee rust, and through that opportunistic door, antracnosis, is a reality difficult to ignore; the marriage of coffee rust-antracnosis is leaving the coffee trees standing dead upright. Nevertheless, its advance and effects are not generalized, they vary from one micro-territory to another. The more concentrated the areas of organic and conventional coffees, the poor management of the coffee farms (producers turned into “harvesters” without technical assistance), and weak social capital (prevalence of crop lien lenders, cooperatives removed from their members), the more affected they are. The families in these micro-territories are already feeling the reduction in their income, there is the risk that they will not honor their debts nor the coffee they have committed to turn in (under crop liens), which will weaken their cooperatives and financial institutions. This will restrict credit just when they most need it to restructure their farms (cut down bad plants, renovate, apply fungicides, fertilize, manage plant tissue) and to survive. Then the next cycle will come and – with or without renovation – they will harvest even less than now…and given that the damage of the coffee rust in Central America is being accompanied by coffee prices going down, in these micro-territories what is coming is high indebtedness, organic coffee converted into conventional coffees, possible change in variety that would affect the coffee quality that the country has obtained, cooperative bankruptcy, dispossession of land, and the possible arrival of impoverishment. The dominant question for responding to this situation has been: How to attack the specific problem of the coffee rust and rescue the coffee fields? At first light this question presupposes a technocratic vision, hiding the causes that created it, making believe that things get resolved only with external resources; it is short term which ignores the consequences in the medium and long term, and is expressed in these times by both those who are demanding attention as well as by those who are announcing policies. Consequently, companies are offering chemical inputs as a panacea to the coffee rust, and some desperate producers are trying to acquire them, without it being the proper moment to apply them, and without thinking about what their coffee and their farm really needs. What is being talked about is the promise of the renovation of the coffee fields, which implies doing nurseries in three months starting now, receiving income for that recently renovated coffee in 3 years, and the worst is that these promises are tempting the producers “to wait” while the coffee rust-antracnosis marriage “is not waiting”, it is advancing like the spread of an oil spill. This medicine is unconvincing, the absence of shared solutions (not necessarily common) is losing time that is more valuable in the face of the coffee rust-antracnosis, and favors more a logic of the large companies – coffee growers and sellers of chemical inputs – deepening the culture of dependency, and ignores the fact that this situation is rather an indicator of an unequal model of coffee growing that has left the small producers without the proper conditions for restructuring their farms. The question that we need to ask ourselves is: How to make the peasant economy viable, which is where the majority of the coffee producers are. This question assumes a more holistic vision that includes the technical, economic, environmental and social aspects; it is short term to the extent that it is also long term, and it is a thinking that expresses the peasant perspective. In what follows we will talk about 3 elements proposed under this framework. First, we need to respond seeking a balance between the technical and economic aspects; the renovation should be with resistant varieties and mixed among varieties that provide a good cup (coffee quality); in renovating the coffee fields, the peasant families should plant beans, corn and plaintains in the corridors, which will generate income in the short term which they urgently need, and in the medium term establish the culture of crop association (coffee+basic grains+plaintains). Secondly, the technical-economic approach needs to be combined with the environmental approach. 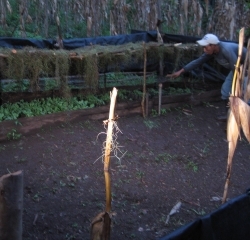 The regulation of shade, complete pruning and renovation leaves the soil coverage unprotected in the face of the impact of the rain, so the solution mentioned of planting basic grains and plaintains in their corridors is also an environmental response, because it will help to protect the topsoil. 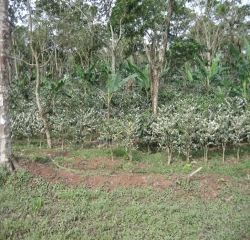 With the regulation of shade (thinning because of high density, thinning for coffee renovation), INAFOR should apply their policies in a flexible manner to allow the peasant families to take advantage of the wood trees on their farms – that income will help them to honor their debts and to invest in their farms. Organic coffee appears to be more vulnerable to the coffee rust and antracnosis, because a good part of that coffee is organic only because chemical inputs are not applied on it (fertilizers and insecticides), but nor are organic inputs applied, and because those coffee fields generally are farther away from the highways and in the hands of the poor strata of the population, who make their coffee profitable through extensive technology – “what I put into it, it gave back to me” said the producer from El Ojoche in the quote at the beginning of the article. It is important, then, that the cooperatives mobilize so that their members provide good management to their coffee plots, that their technicians really provide technical assistance, and try to get these certifiers to adapt their norms to the local conditions that the current situation deserves. Organic coffee certainly requires attention. Those who stipulate the prohibitions on the use of chemical inputs are OCIA, Biolatina, Naturland, the European Union and the Government of the United States. Fair Trade/FLO cert prohibits the most toxic ones that have been internationally condemned. The cooperatives should coordinate with those certifiers to be flexible in their policies, permitting the low use of chemical inputs in the organic coffee fields, in order to effectively counteract the coffee rust and antracnosis. On the other hand, since April 2011 Fair Trade has demanded that at least US$5 of the social premium be used to increase the productivity of the farms; the cooperatives should seek to get most of the amount of the premium to be used to make the peasant economy viable, and that the technicians who are recording data for the certifiers would analyze the data jointly with the producers. Without greater flexibility in the policies and without effective accompanyment for the conversion of their farms, the organic coffee producers, in particular those who are fertilizing with organic fertilizer, will turn toward conventional coffee (and toward UTZ and Rainforest certifications, that are competing with Fair Trade), and if they obstinately persist in remaining organic, they as well as their farms will “look pathetic”. Thirdly, in contrast to most of the Northern Atlantic Autonomous Region and the Southern Atlantic Autonomous Region, the central northern region of the country does not have any more agricultural frontier to expand into, which is why intensification of their agriculture is their only option, whose viability (the productivity of their land, labor and capital) depends on the producers expanding and generating knowledge. The land has become unreliable: the culture of extensive agriculture IS NO LONGER profitable. 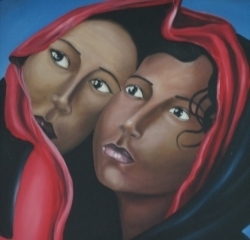 In the face of this reality, it requires technical assistance coordinated between producers, “barefoot” grassroots technicians (promoters) and experts, which should happen in the form of alliances between different organizations and structures for the generation of local knowledge which coincide in the specific micro-territories. This technical assistance should include financial education: instead of taking on debt with businesses like Gallo más Gallo and Verdugo over “luxury consumption”, learning to calculate costs, plan, prevent risks, save, and know how to invest; instead of alcoholism, that along with “luxury consumption” absorbed the income from coffee, organizing the members of the family with different roles to diversify their economies. The experience of NITLAPAN-UCA, and of the LDF microfinance institution, shows that the small producers appreciate the technical assistance when it helps them to increase their productivity and prevent diseases like coffee rust and antracnosis. This increase in productivity reduces their per quintal costs, and generates more income and knowledge for them. If technical assistance, credit and good markets are combined in specific territories, along with good organizations, the families improve their lives, the coffee rust flees, the culture of no payment recedess, and the peasant economy is made viable. These points should also be talked through and negotiated with the organizations and institutions. The state institutions should respond with clear policies (e.g. INAFOR with wood trees on farms) and be prepared with social compensation measures for the situations that are coming. 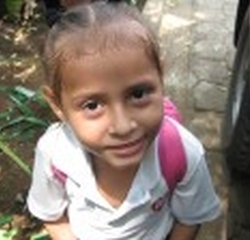 Organizations like CONCAFE should coordinate with homologous organizations in Central America to obtain varieties of coffee that are resistant to diseases and at the same time provide a good cup (high quality scoring higher than 83 points), and thus avoid the risk that everyone in the country goes for the catimor variety that tends to cup below 81-82 points, because of its wooden task and its robusta origin. The grassroots cooperatives should be a space for looking for concrete and quick solutions in each micro-territory; the second tier cooperatives for negotiating – supported by the Coffee Network and the Latin American Coordinator of Fair Trade Coffee Producers (CLAC) – with the international fair trade organizations on being flexible with their policies, and for the promotion of collaboration for more learning among certifiers, technicians and producers. The financial institutions, far from being frightened off, should enter into an alliance with organizations that are innovating in technical assistance and in participatory quick assessments, and with cooperatives that are located in those same territories. The traditional technical assistance (who have been turned into sellers of chemical inputs, messengers of the boards of directors, debt collectors and data collectors for the certifiers), need to turn into facilitators that co-create and trade knowledge with different actors (producers, cooperatives, microfinance organizations, institutions that do research and provide technical assistance, certifiers and fair trade organizations) that have an impact on the territories. In pursuit of shared solutions within a framework of consensus among different actors, the challenge is mobilizing intentions, forces, and opening attitudes to work with the families of the small producers in specific micro-territories, as well as making a commitment to peasant viability: productive reorganization is a reality in which extensive agriculture is no longer profitable and intensive agriculture is the way – at least in the central region of the country where most of the coffee in the country is found.